Last week NASA released Journey to Mars, an inspirational 36-page report that outlines the organisation’s plans to send people to Mars. The document includes plans to capture an asteroid, build a deep-space laboratory, develop new space-travel technologies, and learn how humans can live and work on the Martian surface. Despite its grand vision, however, NASA’s Mars opus is missing two critical things: dollar signs and deadlines. And lawmakers have a big problem with that. The recent announcement of the discovery of liquid water on Mars and the sci-fi blockbuster “The Martian” have put NASA’s ambitions to explore the red planet under a spotlight — and exposed some gaping holes in the space agency’s plans. NASA has stated multiple times that it will send humans to Mars by the 2030s, but this latest report does little to show how it will actually accomplish that. Congress doesn’t necessarily believe NASA’s aloofness is its own fault, since the space agency is largely directed by the Presdient. Last week during a House Subcommittee on Space hearing, members of Congress criticised both the report and the Obama Administration’s lack of financial support for NASA. “This sounds good, but it is actually a journey to nowhere until we have that budget and we have the schedule and we have the deadlines,” Smith said during the hearing. “I hope the administration will change its posture … [T]heir proposals to cut SLS and Orion every single year is not helping us achieve the great goals that most Americans want to achieve in space,” Smith said. 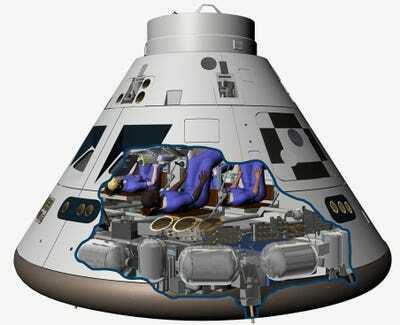 NASAA mock up of NASA’s Orion space capsule. The budget isn’t the only problem we need to solve before we actually see a realistic Mars plan, Rep. Eddie Bernice Johnson (D-TX) pointed out during the hearing. If NASA never knows how much funding it will get year to year, she argued, it becomes nearly impossible to come up with a specific, long-term plan for a journey to Mars. Doing so will take decades of work and require a whole suite of new technology — and steady cash to fund its development. Earlier this year, NASA announced its decision to push back the first launch test of SLS from 2017 to 2018, and the first manned test flight of Orion from 2021 to 2023. Obama’s 2016 budget request for NASA would cut funding even more if Congress approves it, according to The Hill.